The vineyards at Casa Nuestra were established in 1920 as a four acre Petite Sirah planting. From 1961 the vineyards were further developed to include 20 acres of premium grapevines. The Kirkham Family purchased the 40 acre St. Helena property in 1975 and relocated their young family to a turn of the century house among the vines. Within a few years, the Kirkhams replanted the main block of the St. Helena Vineyard to Bordeaux and "Old Napa" Red Varietals. The historical white varietals (Chenin Blanc and Riesling) were maintained and the family continued to farm the family's heritage vineyard in Oakville. In 1978, the Kirkhams applied for, and were granted, the first small winery permit in the Napa Valley. The first vintage for the new winery was 1979 and included wine from the St Helena vineyards and from the Oakville vineyard. Sometime during the growing season of 1979, Eugene Kirkham (Gene) had an epiphany while operating his tractor, which he did in the evenings after returning from his straight job as a lawyer and on the weekends. From that point, Gene committed to farm wine grapes without any synthetic inputs or harmful pesticides and herbicides. Organic certification didn't exist at that time, the Kirkham's commitment to organic farming predates such standards. 40 years later, the vineyards continue to be farmed without synthetic inputs, employing cultivation practices and sheep instead of herbicides, compost instead of synthetic fertilizers, and gentle, non poisonous methods for keeping pest pressure in check. 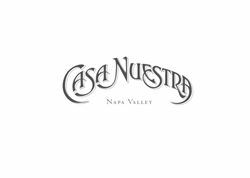 Casa Nuestra specializes in varietals not often found in the Napa Valley. The whites are comprised of Chenin Blanc, which produces some of the longest aging white wines in the cellar and Riesling, one of the Noble Grapes. The red grapes produce an historic Napa Valley "Field Blend," Zinfandel, Petit Sirah, Refosco and a few Bordeaux standards; Cabernet Franc, Cabernet Sauvignon, and Merlot. The property is relaxed, peaceful, and reminiscent of another time. Wine tastings are in the Douglas House, a converted 1890s barn with a beautiful garden and farm animals. The winery is at the end of the drive, in a modest building Gene had constructed in 1978. The winery is perfectly sized to the vineyards and is surrounded by Oak Woodland. We serve our wines in crystal glassware in our historic 1920's farmhouse. We have old rock & roll posters, awards, a thank you letter from the White House, as well as pictures of Elvis adorning the walls. Music in Tasting Room: R & B, Jazz, Rock & Roll. View from Tasting Room: Nestled in the valley, views of organic vineyards. Wine Education: We provide information about our vineyard history along with our soil profile and varietals. To join the wine club, visit www.casanuestra.com or call 707-963-5783. The wine is currently over-subscribed and visits are mostly restricted to current customers. The wait list is moderate and worth joining. Visit requests from members of our allocation list and "club members" are honored first, with wait list next, and the general public afterwards. Club Members enjoy access to our wine gardens, picnic areas, winery visits, complimentary tastings and events, and regular interactions with the owners and the winemaker.